I had a school visit that was cancelled for this week, so I decided to take advantage of the unexpected opening and head up to Rotorua, on the border of the Bay of Plenty and the Waikato region. Routorua is a hub of geothermal activity in New Zealand, so a home to geysers, hot thermal spas and sulfur lakes. 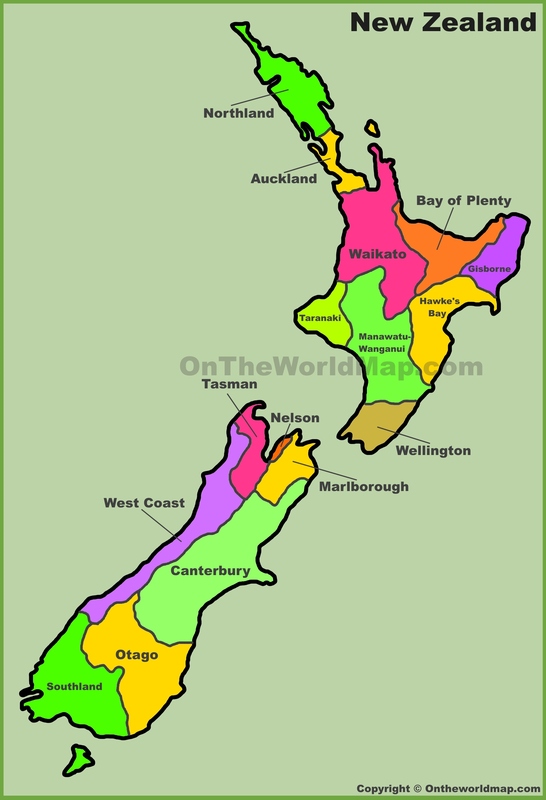 This map from http://ontheworldmap.com is helpful in seeing the regions of NZ. Because of the last minute nature of this trip, I went with the Intercity Bus service, as flights were just super pricey.My bus left early Monday morning, so Julian sweetly volunteered to take me to the train station so I didn’t have to walk in the dark or catch a crazy early bus. The bus departed on time, and the drive was a great way to see the NZ countryside. We stopped at a cafe for a brief stretch, drink and toilet break, and there were even opportunities to see some farm animals there, as you will see below. We did have a bit of a delay – road construction at Mount Doom – (insert cheesy joke here – I have thought of several – they are all really bad). But I still arrived in Rotorua at around 3:45, so I had plenty of time to get settled into the hostel and have some fun. Honestly, I was super thankful that I did the bus, because it was the perfect way to see NZ, and I would have missed the scenery if I flew. The bus seats were comfy (relatively speaking) and armed with my Bluetooth headphones, my handy-dandy travel pillow (one of my best purchases ever, by the way), and a Pandora offline playlist, I was good to go. When the bus arrived in Rotorua, I noticed a particular smell – the Eau de Sulphur, if you will – it took some getting used to, but once I was “adjusted” it was just like background noise. I got settled into Rotorua Central Backpackers – which was one of the best hostels I have stayed in. The beds were not bunks, the hostel “spa” (hot tub) was very nice and Neil and Catherine were wonderful hosts.It was right around the corner from the bus station and walking distance to everything. After I was settled in, I decided to head to the Polynesian Spa to relax in the thermal baths as day turned to night. I was worried it would be overrun with tourists, as their were several tour buses in the parking lot, but it was easy to find pools and places to relax all on my own, and there were several instances where I had nice conversations with locals, backpackers and other tourists as we hopped from different temperature pools. Watching the stars come out sitting in a geothermal spa? – not a bad way to spend an evening. At about 10:30, I walked the 7 minutes or so back to the hostel, so that I could get ready for bed, as I had big plans for Tuesday – Matamata and the Hobbiton tour! Sounds lovely! Thanks for sharing your travels. It’s almost like being there with you. Miss ya!